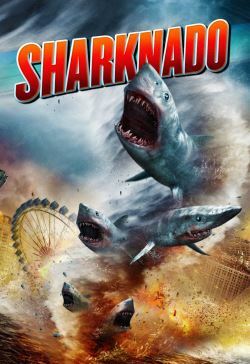 When a freak tornado swamps Los Angeles, thousands of man-eating sharks are sucked into the swirling vortex, terrorizing the waterlogged populace and flooding the city with shark-infested seawater. Surfer and bar-owner Fin (Ian Ziering, Beverley Hills, 90210) sets out with his friends Baz (Jaason Simmons, Baywatch) and Nova to rescue his estranged wife April (Tara Reid, American Pie) and teenage daughter Claudia from the sharks raining down from the skies. With nature's deadliest killer ruling sea, land, and air, they soon realise that the only way to survive the deadly shark-infested maelstrom is to tackle it head on. Their plan? Commandeer a helicopter and fly close enough to launch bombs directly into the tornado!